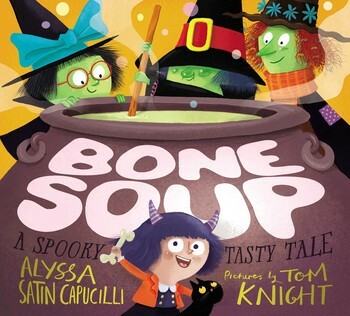 Three little witches and a bunch of spooky characters come together to prepare a delicious batch of Bone Soup in this Halloween tale based on the beloved fable, Stone Soup. This just-scary-enough picture book comes with a recipe for Bone Soup—perfect for Halloween eating. We’ve something usually good to eat! One Halloween morning three witches are looking for a tasty treat and they find only a small bone in their cupboard. So they decide to go from door to door in their village to find just the right ingredients for their Bone Soup. No one in the village is convinced that soup can be made from a bone, until the littlest monster reveals just what the special ingredient should be. Click here to read a wonderful review of Bone Soup by Kirkus.